I just have finished most of the photos to a fictionalized documentary called “Pilecki” directed by Mirosław Krzyszkowski. The producer of the image is the foundation Auschwitz Memento, which raised the donation for the realization of the film from public subscription. Two additional days of photo session still awaits for us in July. Premiere at the cinema is planned for early next year. Photos from the filmset you can see on my website in the bookmark Photos/Gallery. 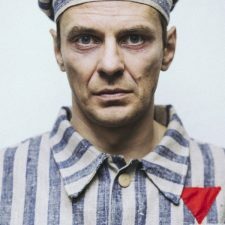 During the filming scene of the escape from Auschwitz I had a lot of luck. It was a day of a pouring rain, as it did during the real escape of the Capitan Pilecki. YOU ALSO CAN CONTRIBUTE TO THE INCEPTION OF THE FILM. WELCOME IN NEW, HOPEFULL YEAR!! Scan the QRCode to open this page on your mobile device. Marcin Kwaśny (born January 5, 1979 in Tarnów) – Polish actor theatrical, television and film, screenwriter. Became widely known for his role a vet Julka Lubczyka in the TV show “Na kocią łapę” on TV Polsat (in 2008), as well as the role of Rafał Kocój in the TV show “Szpilki na Giewoncie (in 2010-2011).